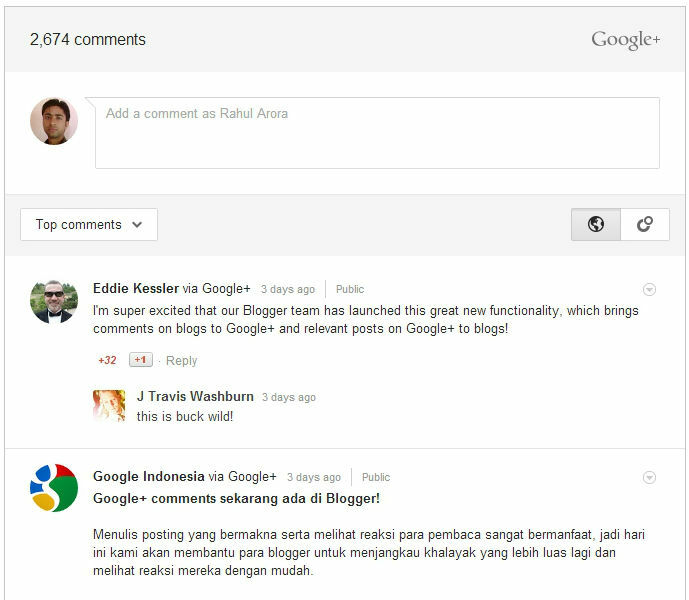 Google+ has rolled out it’s commenting for blogspot or Blogger based blogs. From now, Blogger users can opt into using Google+ commenting system instead of traditional Blogger comments on their blogs. Google+ comments provide a powerful commenting system along with replying, +1 voting of comments, and notifying, sharing and socializing on Google+ as well. This short guide explains how you can turn on Google+ Comments on your Blogger blog in a few steps. After logging into your Blogger account, go to Google+ tab of your blog. In case you haven’t connected your Blogger account with Google+, you should connect it now to get this task done. After connecting your account with Google+, you’ll be able to see the checkbox option Use Google+ comments on this blog in the Google+ section of your Blogger account. Just check on that option, that’s it! You’ve successfully enabled Google+ commenting on your Blogger!